Clair at Cause UK has been working with Leeds City Council to book and co-ordinate dancers, musicians, circus acts and more for a fantastic family day out on Sunday 12th June in Leeds City Centre to provide entertainment at Briggate and in front of the Leeds City Art Gallery. Leeds hosts the prestigious International Triathlon Union World Triathlon Series on 12 June with spectacular entertainment promised along the route. Confirming the city as a major location in global sporting events after the success of 2014’s Tour de France Grand Depart, the inaugural Leeds stage of the 2016 ITU World Triathlon starts with a 1500m at Roundhay Park, 42.5km cycle route into the city centre, ending in a 10km run towards the finish line in Millennium Square. The Columbia Threadneedle World Triathlon Leeds promises to be a regular annual sporting event for the city, further showcasing Leeds as a sporting and cultural capital of Europe. Spectators and athletes taking part will be entertained by some of the region’s leading cultural organisations, as well as visiting acts. Phoenix Dance and Leeds City Varieties will be involving their youth performers to create a special showcase in the city centre to celebrate the triathlon. The Leeds Pipe Band will be parading on the Headrow, and Middleton-based Dazl will be performing flash-mob dances, with up to 50 young dancers taking part. 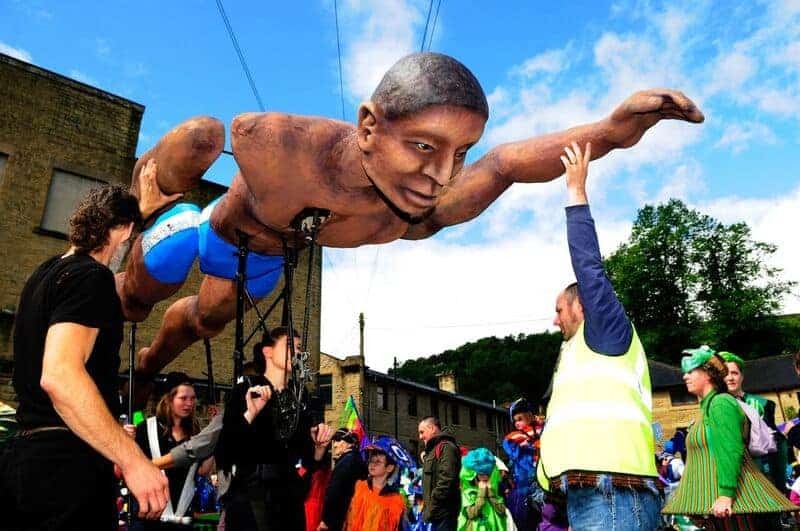 A special parade will take place at 12.45 in front of the Leeds City Art Gallery, with Rio style dancers, Brazilian music and a giant swimming puppet! Adding to the celebratory atmosphere will be carnival bands, comedy acts, balloon artists and giant puppets. One of the most talked about acts around, Granny Turismo, promises to entertain as the first and only shopping trolley dance display team. The city officially replaced London as the UK venue, and joins cities such as Yokohama in Japan, Stockholm in Sweden and Cape Town in South Africa, who are also hosting stages of the world series. Over 200 young performers from Leeds will be involved in entertaining the crowds with special Rio carnival themed acts. Expect to see the following acts and more! This is one of the most talked about acts around. Listen for the screech of burning rubber. No pavement is safe. Meet the first and only shopping trolley dance display team. Join Angie Mack on her hula hoop journey for this hooptastic interactive comedy show that is jam-packed with highly skilled hula hoop tricks, iconic music and a whole lot of heart. This wonderful balloon-art street act helps transform every event into a carnival, party atmosphere. They are undisputedly the UK’s most extravagant balloon artists! Bang On! are a junk percussion duo who create funky beats and rhythmic treats using a huge homemade drum kit which is made from recycled objects. Join ‘Miss Timed’ and ‘Miss Judged’ two firm but fair sports-day adjudicators. Impeccably dressed and determined to keep all fun and games in order with a full range of daft time trials and silly races are backed by live tannoy announcements, score cards and ridiculous medal ceremonies. Everything is a race and a challenge and everyone is encouraged to go for gold! A troupe of totally stunning acrobats from Tanzania, now based in the UK. Set to lively African music, the show progresses through a series of powerful and graceful acrobatic and dance routines. Test your endurance against the weightlifters and dare you compete against the runners in a 100m sprint. These absurdly athletic track and field duo have already represented and won gold for their countries. Youth will be performing a special tribute on the day. Youth dance club from Middleton will perform flashmobs throughout the day.